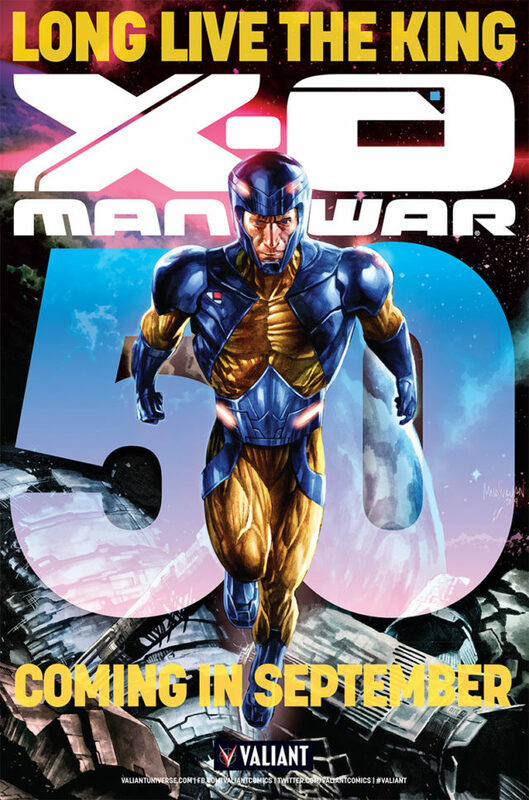 Valiant’s Flagship Series Celebrates the March Toward 2016’s Biggest Finale with X-O MANOWAR #50 COUNTDOWN GIVEAWAY – Featuring Exclusive Micro-Prints or Original Artwork Bagged in Each Issue! 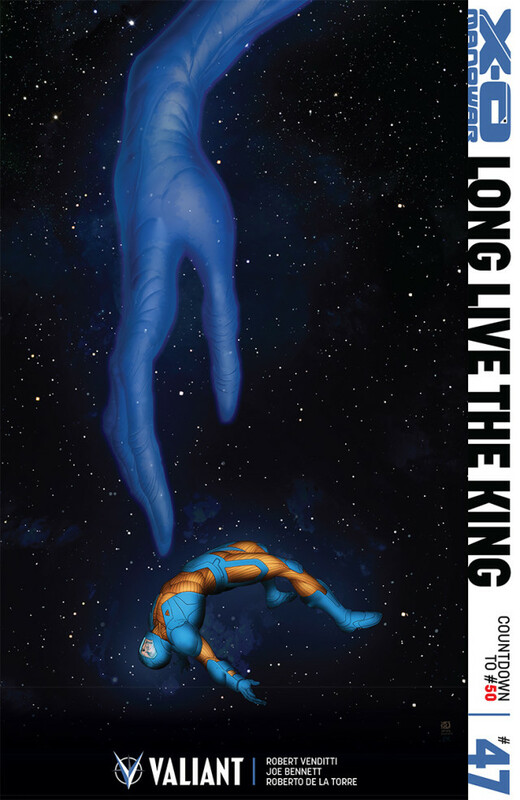 Valiant is proud to announce a series of staggering plans marching toward September’s upcoming X–O MANOWAR #50 – a massive comics milestone that will conclude the epic, historic run of New York Times best-selling writer Robert Venditti on Valiant’s flagship series. The countdown to X-O MANOWAR #50 begins with “LONG LIVE THE KING” – a striking cosmic showdown beginning this June in X-O MANOWAR #47 by Venditti and acclaimed artists Joe Bennett (52) and Roberto de la Torre (Daredevil) that will bring Venditti’s award-winning and critically lauded superhero saga to a world-shaking finale…and mark the beginning of an all-new era for the future of Valiant’s most powerful hero! 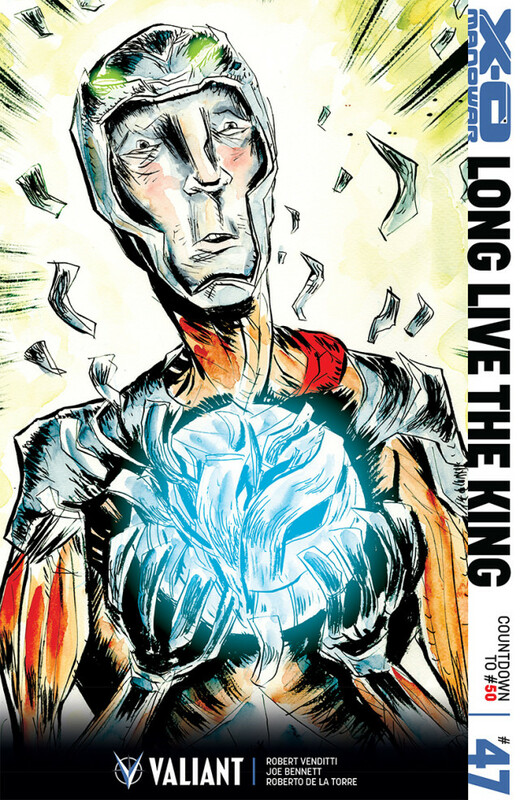 Abducted by a brutal race of extraterrestrials known as the Vine, Aric wad forced into slavery on an alien world. 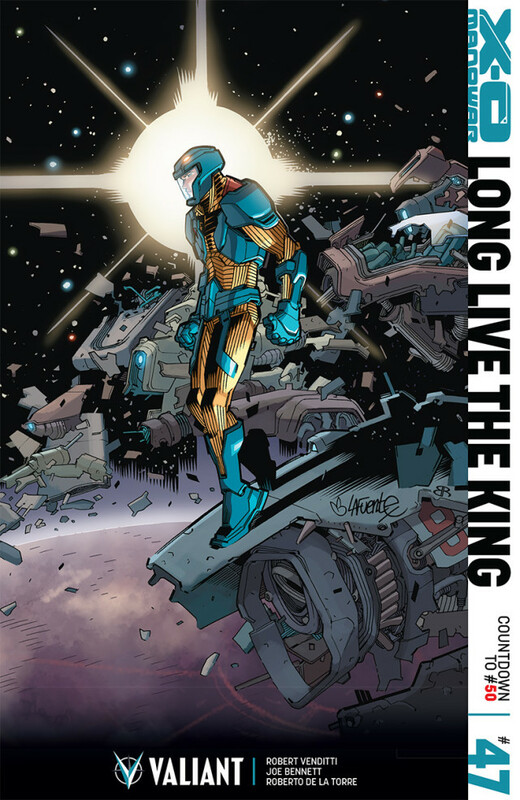 Torn from family, his people and his nation, he spent years plotting his escape…until the day came that he was able to seize a weapon of incalculable destruction – a sentient suit of alien armor – and become X-O Manowar! 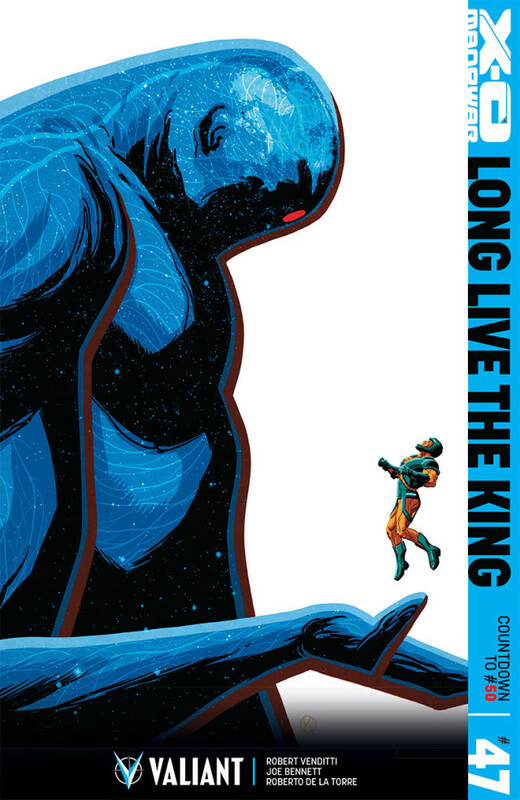 The march toward the greatest Valiant milestone of all time starts here as Robert Venditti, Joe Bennett, and Roberto de la Torre begin “LONG LIVE THE KING” this June in X-O MANOWAR #47 – featuring covers by Kano (Swamp Thing), Phil Jimenez (Amazing Spider-Man), Khoi Pham (Mighty Avengers), Clayton Henry (ARCHER & ARMSTRONG), Rafa Sandoval (X-O MANOWAR), David Lafuente (Ultimate Spider-Man), and Jeff Lemire (Trillium)! 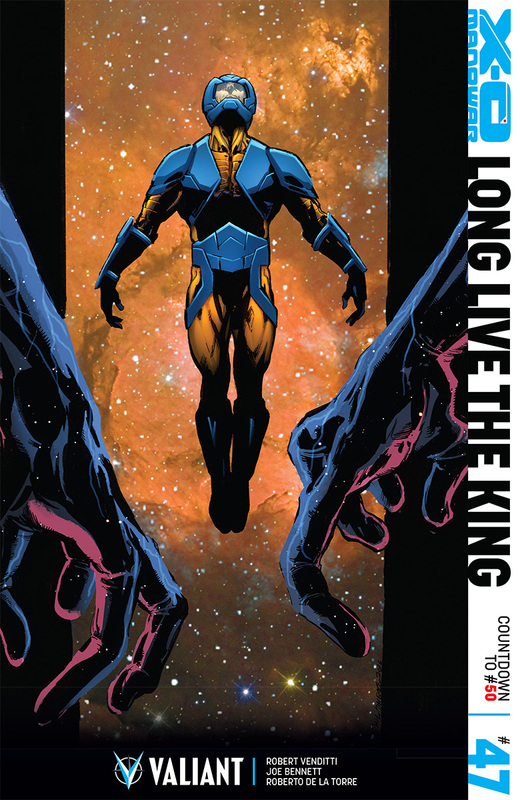 The countdown to X-O MANOWAR #50 represents the epic culmination of Robert Venditti’s unmatched, 56-issue tenure on Valiant’s leading character. 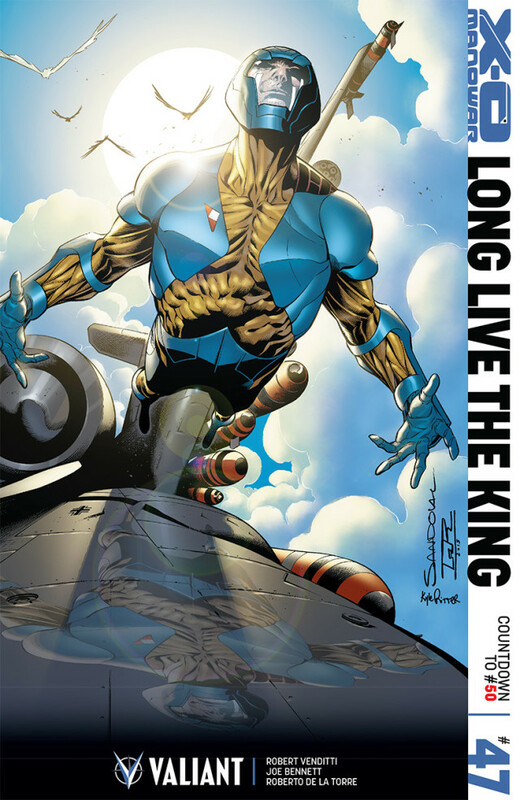 Since the release of X-O MANOWAR #1 in 2012, Venditti’s work on the series – alongside a star-studded line-up of artists including Cary Nord, Lee Garbett, Trevor Hairsine, Diego Bernard, Robert Gill, and many more – has gone on to the become the single longest consecutive run from any creator in Valiant’s history, as well as one of the longest consecutive runs on a single series from any creator in the industry today. 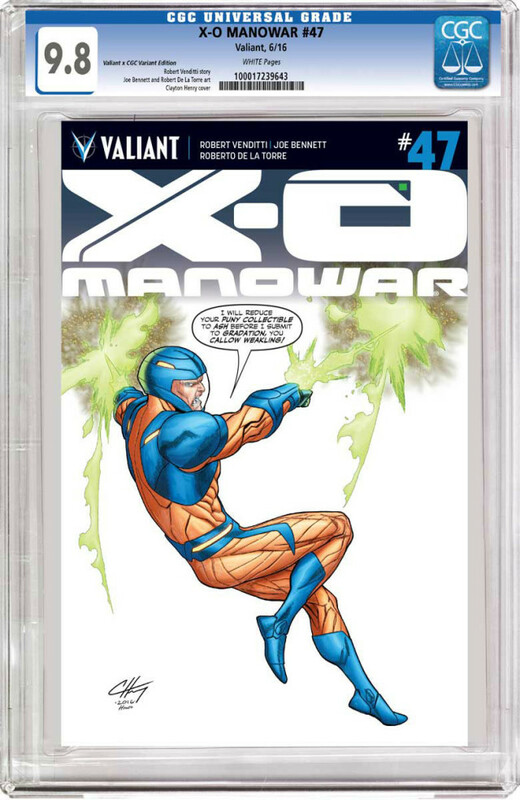 In the wake of the series’ final issue in X–O MANOWAR #50, Venditti will continue to contribute to Valiant’s award-winning publishing line with WRATH OF THE ETERNAL WARRIOR and other as-yet undisclosed projects. Look for many more details on X-O MANOWAR #50 and the X-O MANOWAR #50 COUNTDOWN GIVEAWAY to be announced in the immediate future.